As a rule, Sept. 1 is not a full school day and children can return home once the celebrations have finished. Source: ITAR-TASS. 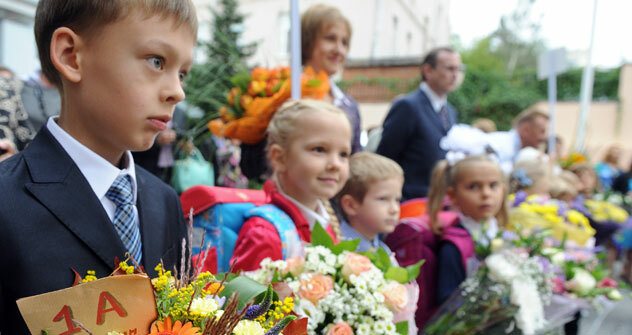 Millions of Russian students, parents and teachers prepare for a new academic school year. The beginning of September is not just about the coming of autumn; for many, it means the start of a new school year. As August comes to a close, Russian schoolchildren return from holidays away at summer camps, dachas or their grandmothers’ homes in the countryside, and families set about preparing for the new academic year. By Sept. 1, children have to be ready to hit the ground running – pencils need to be sharpened, schoolbags purchased, and new school shoes polished. On 1 September 1984, the Supreme Council of the USSR officially designated the first of September as the official ‘Day of Knowledge’. Like all holidays, this one has its own traditions. On this day, schools put on a special celebration to mark the start of the year – teachers and pupils assemble to listen to songs and poetry; congratulatory and inspirational speeches are given by the schools’ head teachers and, sometimes, by members of the local administration. It has become traditional for top politicians, including Russia’s president and prime minister, to take part in the new-term assemblies at the country’s most prestigious schools. This year a special surprise awaits schoolchildren in Moscow where, in some places, the Day of Knowledge will be marked by a visit from Olympic medalists of the 2012 London Games. On September 1, 2012, a total of 47,823 educational establishments will open their doors in Russia. This year, at least 13,356,000 children will embark on another school year – 260,000 more than in 2011. Flowers and ribbons are an integral part of the celebrations, as well. Flowers are traditionally given to teachers, and white ribbons are either worn on clothing or fastened into the hair of schoolgirls of all ages. At the end of the ceremony, a girl in the first grade will sit atop the shoulders of a boy in his senior year (aged 17-18). This little girl is then given a bell, which she will ring loudly as she is carried past a crowd of spectators. Ringing this bell officially starts the new school year. After pupils have gathered and have been introduced to the teachers, most schools then hold open lessons for guests and parents. This year many schools will give a “lesson in valor”, in remembrance of Russia’s victory in the Patriotic War of 1812. As a rule, Sept. 1 is not a full school day and children can return home once the celebrations have finished. However, on the following day the school routine starts in earnest and parents return to school only for parent-teacher meetings. Getting a child ready for school can cost parents between 11,000-17,000 rubles ($345-530), depending on their age. Most of the time in Russia children of all ages will remain at the same school throughout their academic career, from first to eleventh grade, with children from the ages of 7 to 18 all studying in the same building. Kids spend four years at elementary school, five years in junior high school, and two years in senior high school. At the moment, a new curriculum is being developed in Russia, so that children will spend a total 12 years in school education, and six years in middle school. It is hoped that the new program will give pupils more time to learn core subjects, so that they can then concentrate on professional skills in their senior years. It has not yet been decided when schools will switch to the new system. Children need new schoolbags, pencil cases, pens and pencils, along with exercise books, textbooks and other stationary. In addition, parents need to budget for new clothes, a couple of pairs of shoes, sports gear, and sometimes even skis for P.E lessons in the winter. Few schools in Russia insist on pupils wearing a uniform. Uniforms might save money in the long run, but many kids and their parents are against the idea because it is seen as stifling individuality. Most of the time, pupils are allowed to dress as they want. Another thing that parents bear in mind when calculating costs is school meals: in many schools, breakfast and lunch fees need to be paid. Parents have to pay a lump sum each month or children can choose to buy something to eat each day in the school canteen. For this reason, schoolchildren are often given pocket money from quite a young age. At the moment, the Russian government is pushing for free meals to be given to all schoolchildren.